I am glad the Arcata Farmers' Market has started its 2008 season. My Saturday mornings are once again convivial and exciting. I have already tried two kinds of previously untasted greens (purslane and amaranth greens) as well as the hulled barley I mentioned in a previous "Table Talk" article. A round of culinary explorations is off to a great start. What I have bought most often in the first few weeks of the market are leeks. When, as an adult, I ate leeks for the first time, in a leek gratin, it was love at first bite and the beginning of an enduring affection. Because of my avowed partiality for leeks, I don't need any special encouragement to add them to my shopping basket, whether at the market or at the grocery store. I buy leeks in pairs, as if the sight of a lonely leek were too sad to contemplate. Sometimes I buy more than two, knowing by the time I get home, I will find ways to use them within a few days. 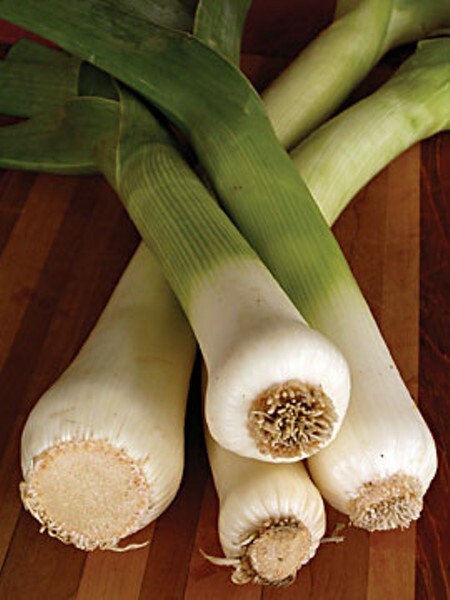 More delicate and sweeter in flavor than onions, leeks have their own distinctive personality. As supporting cast, they provide nuance to a dish; as team players, they contribute generously to it; as solo performers, they shine. Because of their ability to acquit themselves well in different roles, leeks are a popular ingredient of many dishes, from soups to gratins to vegetable medleys (for an example of the latter, see "Table Talk" July 19, 2007). In this column, I will describe a couple of recipes that feature leeks as protagonists. The first one was the answer to a craving for poached eggs that assailed me a little while ago. As I was taking my usual end of the day relaxing walk away from the computer, I had a clear vision of a bed of leeks over which I would place a reasonably well-shaped poached egg. The "reasonably" comes from the fact that the aesthetic aspect of cooking is the hardest one for me to manage. Let me put it another way: my dishes often have an easier time tasting good than looking good. Back from my walk, I got down to work. It was one of those rare evenings when I was at home by myself, so this recipe was conceived for a single portion, but it can be easily doubled or more. Trim the roots and dark green top of a leek, then wash it. It is important to check the space between the fragrant layers for the unwanted presence of grit. How to accomplish this depends on how the leek is cut for its subsequent use. For my home-alone dinner, I cut the white and light green portion of the leek lengthwise, washed the two halves, then cut each half into 1/8-inch-thick slices. When all was said and done, I had 4 oz. of white and pale green leek half-moons. While preparing the leek, generously spray a small frying pan with olive oil and warm it up. Place the sliced leek in the pan, add some fresh thyme (the leaves of one or two sprigs, to taste) and stir well. I love the flavor of fresh thyme and find myself adding it to many dishes. It is a rewarding plant to grow (I just planted a fourth specimen in my little herb garden) and very useful in the kitchen. Cook gently for five minutes over low heat, stirring often. Add two tablespoons of vegetable broth and a tablespoon of water and cook for seven minutes more, then add a tablespoon of white wine and continue cooking for another 10 minutes, stirring every now and then. If necessary, add more liquid. Differently from onions, leeks don't brown nicely and it is important to keep them moist. The leek will soften, but should maintain a lightly crunchy texture that will contrast nicely with the soft egg, which I will discuss next. While the leek is cooking, poach a fresh, good quality egg. I have seen various types of egg-poachers available for purchase, but I am not convinced that I need a gadget to do what requires just a pan with simmering water, a small bowl to hold the cracked egg and a firm hand to make the egg take a clean dive. I realize that, in so doing, I accept a less beautiful result, but also the challenge of practicing in order to improve the visual element. Back to the leek, which should not be forgotten. When it is ready, adjust the salt and sprinkle over it a few finely chopped leaves of fresh marjoram, another herb I like a lot and use often since I have easy access to it in my herb garden. Shortly before the egg is cooked, spoon the leek into a bowl, then gently place the poached egg over the prepared pale green bed and finish off the dish with a tablespoon of freshly-grated parmigiano. The evening I first tried out this recipe, I tasted my creation in solitary enjoyment, every mouthful slightly different in flavor and texture, depending on the fraction of egg that it included (yolk only, egg with some white around it, white only). I have already remade the dish more than once, and the recipe will probably go through further refinements. The second leek offering is a risotto, in which fresh goat cheese joins leeks to round off the show. Trim the roots and dark green top from a leek (or, depending on the size, two), wash it, and, again, cut it into 1/8-inch thick slices. You should have 5-6 oz. of rounds. Bring three cups of vegetable broth to a simmer in a small saucepan. Warm up half a tablespoon of olive oil in a bigger saucepan. Add the leek slices and cook over low heat for five minutes, stirring often. Add half a ladleful of the simmering broth to the leek and simmer for seven minutes. Cut the leek lengthwise, wash each half, then cut in 1/8-inch slices. Warm olive oil in a small frying. Add the leek slices, stir to coat with oil, add thyme leaves, and stir again. Add the broth and water, stir and cook for 7 minutes. Add the wine and cook for 10 more minutes, stirring every now and then. Add more liquid, as necessary, to keep leek moist. Adjust salt, add marjoram leaves and turn off heat. When the leek is almost ready, poach the egg. Pour the leek in a bowl; place the poached egg over it. Wash leeks, cut in 1/8"-thick slices. Bring broth to a simmer in saucepan. In a separate saucepan, warm up oil and add leek slices. Cook leeks over low heat for 5 minutes, stirring often. Add half a ladleful of the simmering broth, stir and cook for 7 minutes. Add wine and stir another minute. Add broth, one ladleful at a time, until rice is cooked al dente (about 15 minutes). Add crumbled chévre to the risotto, turn off the heat and mix to blend. Adjust the salt. Eat, immediately. Enjoy.